The Grötzinger coat of arms shows a stylized tower and once contained the spot sign "f" of a place with market law. The tower says the formerly populated by the Lords of Grötzingen, from here conspicuous "Durlacher" Tower Mountain. Already in the 11th century is reported by Count Berthold von Hohenberg, the Tower Mountain, as lord and residents of the castle Grötzingen. 200 years later large parts are destroyed, but rebuilt by 1288 under the first owner Baden Margrave Rudolf I.. In the early 16th century, the castle turns into Durlacher possession. The district coat of arms in its present form - divided into two parts with Baden coat of arms and golden tower on a blue background - goes back to the coat of arms of 1494. It was recommended in 1901 by the General State Archive of the community and also adopted so. In the meantime, we took advantage of the coat of arms without the Baden half in different variants with the spot sign, which is still to be found in some buildings. Since its incorporation, it serves as the district Grötzingen coat of arms. Many of the formerly independent communities still around Karlsruhe were incorporated at the beginning of the 20th century by the ever growing city. Grötzingen retained its independence long and had to ultimately decide 1973 between Karlsruhe and Pfinztal. Even if only by a small majority, the decision was made in favor of Karlsruhe. 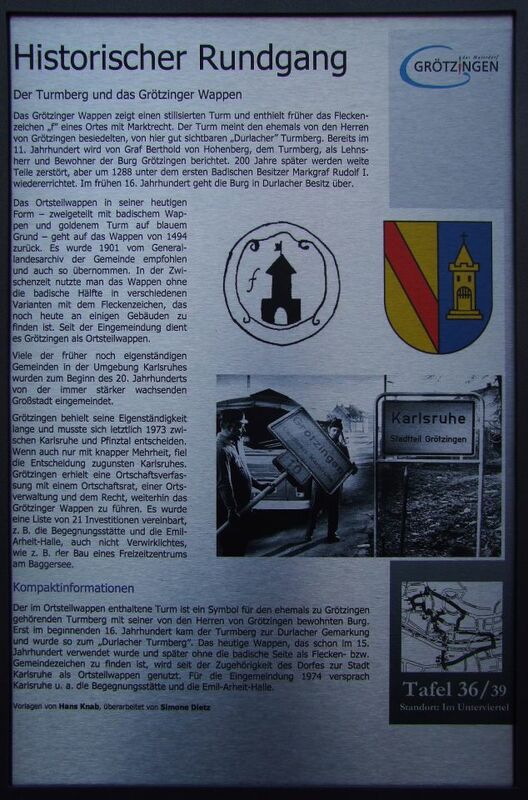 Grötzingen received a town constitution with a Ortschaftsrat, a local government and the right to continue to lead the Grötzinger coat of arms. It was a list of 21 investment agreed for. B. the meeting and the Emil-Arheit-hall, not even Realized such. Example of the construction of a leisure center at the lake.